Neck pain has been one of the most common disabilities known to be suffered by people in everyday life. Almost in all the age groups (mostly in middle & old age) people complain about neck pain and their inability in carrying out their daily activities due to it. 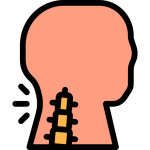 The pain is generally in the back of the neck and along the muscles in the sides between the neck and shoulders. In many cases, neck pain is caused due to poor posture and faulty ergonomics in the people working for long hours and computer on a desk. These positions lead to overworking of muscles in the neck making them ache due to fatigue. Degenerative changes in the joint and discs between the vertebrae causes pain and restrictions in the range of motion and is associated with other physical impairment. Cervical Spondylosis: – Age related wear & tear of cervical discs leading to pain & muscles spasm in the neck which may or may not be accompanied by tingling or numbness and pain radiating in the upper back & arms. There can also be swelling in the back of the neck due to inflammation. Cervical Spine Stenosis: – Narrowing of Spinal canal &/or spinal nerve root passages in the neck causing symptoms such as pain, numbness, tingling and weakness. Cervical Facetal Arthropathy:- Degeneration in the facet joints gives symptoms of pain in the neck which may be radiating in the arms, tenderness at the joints, swelling, restricted range of motion. 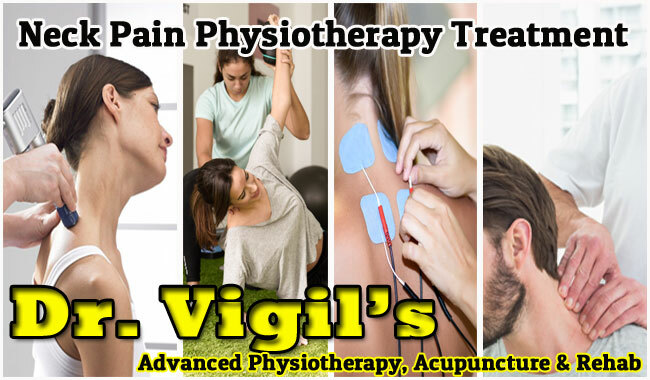 A sudden catch like sensation in the neck when the soft tissues (muscles & ligaments) in the neck extend beyond their typical range of motion due to trauma (Whiplash Injury) is also a common condition causing neck pain which can be mild in the beginning but may lead to a long term discomfort. Other symptoms associated with neck pain can be headache, dizziness, stiffness in the neck, weakness in arms, fatigue. Neck pain is a symptom of many conditions, as treatment of neck pain depends on what condition is been diagnosed and how are the other symptoms associated with it. Analgesics for pain relief, NSAIDS (Non-steroidal anti-inflammatory drug) to reduce pain due to muscle spasms and in some conditions antidepressants are also prescribed reduce pain & related symptoms in the neck. Develop dynamic strengthening of neck and its Sujpacting Masclature. Develop strategies to prevent pain from recurring. Improving neck posture & function in daily activities. Cervical traction devices treat different types of cases of neck pain including conditions like cervical spondylosis. It helps to relax the muscles, which can significantly relieve pain and stiffness while increasing flexibility. It is also used to treat herniated discs and pinched nerves. It can relieve pain from joints, sprain and spasms. This improves mobility, range of motion and alignment of the spine. Many superficial and deep heating modalities such as heat pads, shock wave diathermy, ultrasound, paraffin baths, whirpool baths etc. Are used to relieve and relax the muscles. Electrical Stimulating currents such as TENS (Transcutaneous Electrical nerve Stimulation) and Interferential current are used for modulation of pain through stimulation of cutaneous sensory nerves and following pain gate mechanism. One of common manual techniques used in to reduce spasm is to release trigger point in the neck reducing pain commonly known as myofascial release (MFR). It also helps in correcting alignment of the neck and improving the function. Proper stretching and strengthening program is highly effective to relieve pain and increase efficiency of the neck and the muscles to carry out various daily activities without any distress. Stretching expands and preserves the range of motion & elasticity in affected cervical joints and relives stiffness that accompanies pain. Specific strengthening exercises including neck isometrics and dynamic strength training for neck & shoulder muscles will help to maintain improved posture which in turn eliminates recurrent flare ups of neck pain.